Can my guests forward the invitation to others? 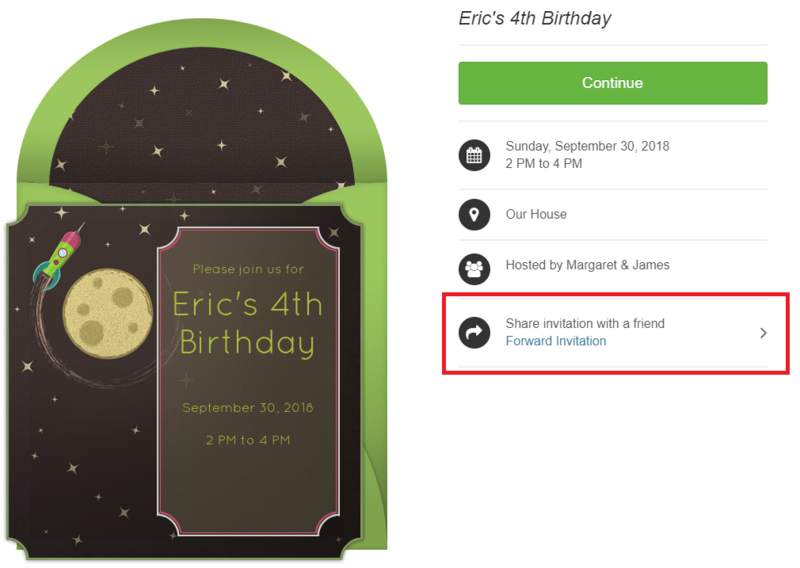 Guests can use the "forward" link on their invitation to forward to others. A guest who received the invitation from a forward (the "forwardee") will show up on your guest list with "FWD" in the Sent column. Guests can only forward the invitation to another guest's email address and not to a phone number. If you would like, you can also choose to turn off the forward link on your invitation. First, go to your Invitation Options page and click on the Advanced Features tab. Choose OFF for the Allow guests to forward the invitation option. To turn off the forward link on your invitation through the mobile app, tap on the Invitation Options button and click on the Show button for the Advanced Features tab. Choose OFF for the Allow guests to forward the invitation option. Note: If a guest forwards the actual email that contains the invitation (instead of using the Forward Invitation link) they are essentially giving someone else their invite. Anyone they forward to will be RSVPing under the forwarder's name instead of their own name.